Jamie is just like everyone else. Just trying to find her place, her purpose. She puts the weight of the world on her shoulders because if she doesn't, who will? She feels like she has to be everyone's strength. 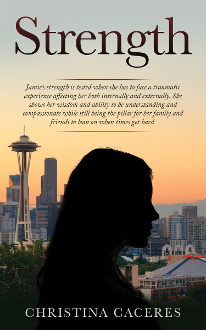 She tries to keep from being a burden; going only to her family when she feels overwhelmed. But what happens when her best friend tries to share the burden she places on her shoulders with her? Will she let go and let someone help her or continue to fight and try to face the world and its problems by herself? Michael is naturally a caring person. He'll do just about anything for the people he calls friends or family. Yet, even that doesn't compare to what he would do for Jamie. He would turn the world upside down for her. He fights to be the rock she needs whether she sees it or not. But his own strength is put to the test when his best friend goes through an unexpected turmoil, his feelings for her become harder to hide. Will he be able to push forward or will he be stuck in the past, wondering if there was more he could do?